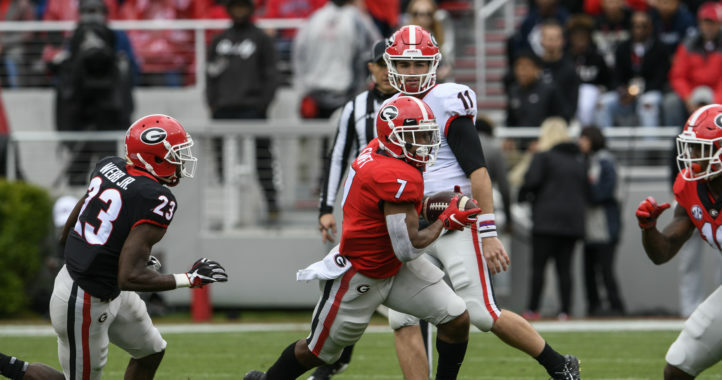 Georgia has won back-to-back SEC East games over the previous two weekends, which have resulted in delivering another division title to the Bulldogs. That’s the good news. The bad news? Georgia can’t seem to punch it in the end zone near the goal line. That’s something that will obviously have to change if Georgia is going to accomplish more than simply winning the SEC East. 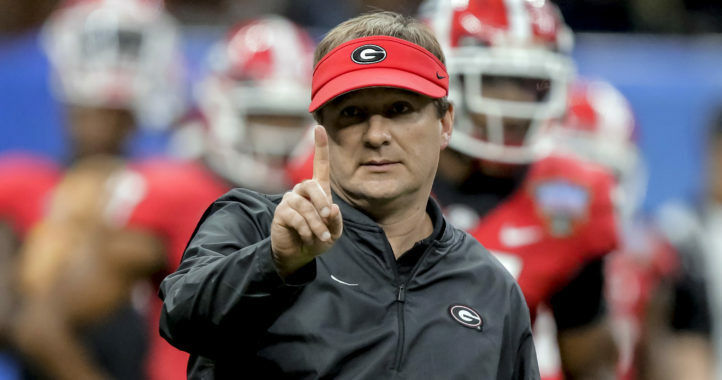 Florida stuffed the Bulldogs time after time in Jacksonville and managed to keep Kirby Smart’s team out of the end zone on seven consecutive plays at the goal line two weeks ago and Kentucky managed to do something similar late in the contest last weekend. Once the Wildcats held the Bulldogs to a field goal, Smart went off on the sideline. The Georgia coach was recently asked about his screaming fit on the sideline — was it playcalling or executing that got him so mad? — and if that was the maddest he’s ever been since becoming the leader of the Bulldog program. Ummm, No Coach, it’s your pi$$ poor play-calling on the goal line. Why do you continue to run into the huge pile of bodies time and time again? Why run into an area where 20 bodies are within 3 yds of the ball? Why does the TE not block the same player three straight times? Either bunch everyone at the snap and toss a run wide or at the very least go with a 3-4 wide out set and get half of the Defense away from the ball? Use Fields maybe? He at least presents a dilemma for the Defense run or pass……continuing to do the same thing over and over expecting different results is insanity. Kirby doesn’t call offensive goal line plays. That would be Jim Chaney. 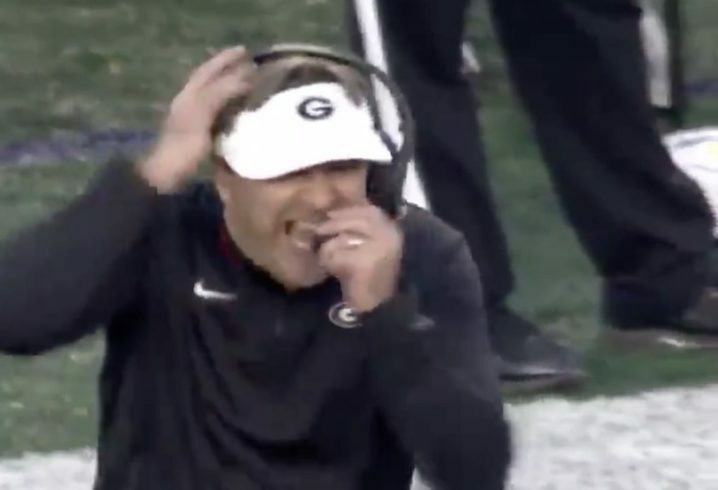 I will be honest, after the UF game I thought Kirby was forcing Chaney to call the power runs and sneaks at the goal line but after Kirby almost broke his headset in two at Kentucky I am 100% positive that it is all on Chaney. I believe we won that game going away. Spread em out at the goal line. Single Back Bunch Sets are not working and neither is the sneak. Use the pistol read-option with Fromm or Fields and spread your receivers out to create space. Exactly. The defense would need to make a decision: put 8 in the box to stop the run, or cover the receivers and be outnumbered on the line. When you pack in 22 bodies it puts the defense at an advantage. No matter how good you are, 9-10 bodies beats 6 more often than not. Spread ‘em out and Jake walks in half the time on the read option. Really screw with the DC and put Fields in at RB – Jake could walk in 100% of the time on a keeper. Heck, that sounds good too. We need to change something up because what we are doing on the goal line is not working. Whatever happened to the Wild Dawg we successfully ran time and time again on short yardage goal line offense?!?!? 2 to 3 back set and run around either end until you get to the pylon. It’s not rocket science folks! Maybe even try a halfback pass to the corner of the end zone either to the TE or even to Jake Fromm/Justin Fields. Except we don’t have halfbacks under Kirby. Hated to see that position go, but with a 70-man travel roster limit every guy has to be productive. Well, actually the halfback aka tailback is also called a running back. I guess I am just old school. Every time we try a jet sweep or an end around or a reverse end around it usually gets stuffed. What ever happened to Mecole in the Wild Dawg….if I recall it was productive 100% of the time.